Salisbury and the surrounding area has a proud wartime heritage for thousands of Spitfires were built here in sheds, garages, bus depots and even a hotel. Norman Parker, one of the last surviving Spitfire engineers, talks about the top-secret wartime construction of the RAF’s most celebrated fighter plane with Ethem Cetintas, director of the acclaimed film, The Secret Spitfires. The battle of Arnhem, the great airborne fight for the bridges in 1944, was a courageous strategic gamble that failed. In this talk at CVHF 2018, Britain’s best-selling historian Antony Beevor, using often overlooked sources from Allied and German archives, reconstructs the terrible reality of the fighting and questions whether this plan to end the war could ever have worked, or whether it was always doomed to become the last German victory. Hanna did not discuss the Nazi regime or politics with John, but when he mentioned her jewelry she told him that she had also kept her Iron Cross but did not wear it ‘every day’. It seems to confirm that Hanna was, as the brilliant British Royal Naval pilot Captain Eric ‘Winkle’ Brown had told me during my research, ‘a fanatical Nazi’ to the end. Enemy searchlights had caught its outline as the RAF Whitley reached Nieuport on the coast of Nazi-occupied Belgium, and the German batteries opened up. But unscathed, the pilots pressed on, heading inland as instructed. Just minutes later, passing above the darkened fields of Flanders, the crucial moment had arrived. The flaps of the aircraft were lowered and, from a height of between 600 and 1,000ft, a British ‘agent’ parachuted gently to the ground. This was July 1941, and an extraordinary new development in the intelligence war with the Wehrmacht was in full swing. So important was the information gleaned from this particular mission, it would end up on Churchill’s desk. Yet the figure floating down through the Belgian night was no normal operative, vulnerable to capture, to torture or to worse. For this was Operation Columba, a largely forgotten yet essential weapon in the fight against Nazi Germany, and one that played an important role in turning the fortunes of the War. And the spy it was despatching behind enemy lines? A pigeon. I first stumbled across this remarkable tale by chance one morning, while covering a quirky news story for the BBC. The boney leg of a dead pigeon had been found in a chimney in Surrey and attached to it was a message which, after investigation, had stumped even the top code-breakers of GCHQ, unable to decipher a seemingly random series of letters. What might this strange relic mean? No one seemed entirely sure. Could pigeons have been used in the Second World War, perhaps? Again, information was scarce. My interest piqued, I spent a morning in the National Archives in Kew, West London, pulling up any and every relevant file – and one of the bundles that landed on my desk immediately stood out. Marked with the words ‘Secret’ and ‘Columba’, it contained compelling details of an operation, including tiny pink slips of paper that transpired on closer inspection to be messages from ordinary people living in occupied Europe. They had clearly been brought back to Britain by pigeon. Filled with the day-to-day realities of wartime, the slips offered an intriguing insight into the small frustrations and dark tragedies of life under occupation. None of them, however, compared with the one labelled Message Number 37. More like a work of art than an official document, it contained tiny, beautiful inky writing, too small to read with the naked eye and densely packed into an unimaginably small space. And detailed, colourful maps. Who had written it? And what had happened to them? There was little to work with as the message was identified with no more than a code-name – Leopold Vindictive. After three years of searching, I finally found my answer in rural Belgium. The story of this unlikely spying mission began in April 1941. There had been attempts to drop secret agents behind German lines since the summer of 1940, but they were perilous. Some agents died before they hit the ground. Others were captured all too quickly. So slim were the intelligence pickings that the secret services were even instructed to see if a Yorkshire astrologer and water diviner known as ‘Smokey Joe’ could help. MI6 had agents abroad, but the human networks were a mess. In 1940, it was even claimed that German troops in Norway were practising the bagpipes and training to swim ashore wearing green watertight suits. And so an unlikely new strategy was devised – of dropping homing pigeons into occupied Europe in the hope they would fall into the hands of sympathisers who would send them home with information useful to the Allies. Each bird would be placed in a special box with a parachute attached, and a tiny green Bakelite cylinder – about the size of a pen top – was placed around one leg.On the outside of each container was an envelope with a questionnaire, written in Dutch or French, some rice paper for the return message, a pencil, and a bag of pigeon food. The latest edition of a resistance newspaper printed in London was enclosed, or sometimes a copy of the Daily Mail, to prove the bird had come from England. Details of the operation were kept secret from the pigeon fanciers who volunteered the birds. So who was behind this outlandish mission? Today, everyone is familiar with MI5 and MI6, but few have heard of MI14, let alone its sub-section MI14(d). Its job was to understand the German occupation of Western Europe. Working out of a basement room in the War Office in Central London, it initially comprised just two officers: Brian Melland, a former theatrical actor, and ‘Sandy’ Sanderson, who had served with the Highland Division in the First World War. This was the unit in charge of the Secret Pigeon Service. Operation Columba got under way on the night of April 8, 1941. A Whitley crossed into Belgium near Zeebrugge then headed for the French border, where the pigeons in their containers were pushed out. Two days later, in the bowels of the War Office, at 10.30am, MI14’s phone started ringing. The first bird had made its way home to its owner in Kent. Columba message number one was phoned in. It had come from a village called Le Briel in northern France and contained real information. ‘Pigeon found Wednesday 9th at 8am,’ it began. ‘The German troop movements are always at night. There are 50 Germans in every Commune. There is a large munitions dump at Herzeele 200 metres from the railway station. Yesterday, a convoy of Horse Artillery passed towards Dunkirk… The Bosches do not mention an invasion of England. Their morale is not too good. The RAF… should come to bomb the brick works as the proprietor is a …’ The next word was marked as ‘illegible’. The message ended with ‘I await your return, I am and remain a Frenchman.’ At 3pm, message number two arrived, this time from Flanders. After three months, 221 birds had been flown into occupied territory, many from Newmarket racecourse – home to a top-secret RAF squadron whose job was to carry out ‘Special Duties’ for British intelligence – and released over Flanders, Normandy and Brittany. Forty-six had returned, 19 with messages, of which 17 contained information. 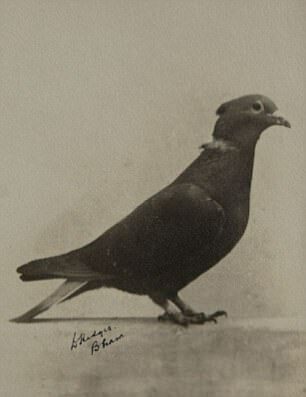 Often people were fearful at discovering a spy pigeon, and understandably so. Many decided it was better the pigeon died than they did. Some villagers even made the choice more palatable by roasting and eating the bird. Others went straight to the local police station or Nazi occupiers in return for a reward. The people responsible for the remarkable Message 37 were braver than that, and fiercely anti-Nazi. The pigeon and its container had been retrieved in July 1941 from fields near Lichtervelde by an unnamed Belgian farmer. Concealing them in a sack of potatoes, he took them to the Debaillies, a patriotic family of two sisters and three brothers who ran a corner shop. One of the brothers, Michel, was a pigeon fancier. The Debaillies summoned two family friends, Hector Joye, a former soldier with a love of military maps, and a Catholic priest, Father Joseph Raskin, who had worked as an intelligence gatherer sketching German military positions during the First World War to aid allied reconnaissance. Brothers Arseen and Gabriel drove along the coast and through the neighbourhoods around Bruges, taking notes. Joye gathered intelligence on a chateau occupied by German troops. Raskin tapped church-goers for information. After a few days, the priest set about transferring the maps and the wealth of information to the two tiny sheets of rice paper. He worked through the night of July 11 using a magnifying glass and a fine-tipped pen until all the space was filled. The rice paper was folded and placed inside the cylinder attached to the pigeon’s foot. Then the group did something contrary to every rule of spycraft: they stood for a family portrait in a courtyard behind the shop. At first sight, it could be any other family picture, but look more closely and you can see that Marie, the elder sister, is holding a resistance newspaper, Margaret is holding the parachute. Arseen holds a pencil, Gabriel the British intelligence questionnaire, and Michel clutches the pigeon. In front of them, is a chalkboard with the dates of the bird’s arrival and departure, its ring number and the phrase ‘Via Engeland’ to mark its destination. And at the top are three capital V’s – the symbol of Victory. Climbing up on to the roof, Michel then released the bird. At 8.15am the pigeon rose high into the sky, circled to get its bearings, then made for the Channel and home. By 3.30pm, it was back at its loft in Lattice Avenue, Ipswich, with the canister arriving in the War Office on July 13. Melland pulled out the first sheet of paper, nine inches square, and the closer he looked, the more astonished he was. The transcript came to a remarkable 5,000 words and took up 12 pages. It was gold dust. It indicated hidden German emplacements, munitions depots and fuel dumps. It highlighted a telephone exchange and nearly a dozen factories playing a role in the German war effort. There were precise battle damage assessments of recent British raids in Brussels. A map showed a château that was the central communications installation for German High Command in the whole sector. Message 37 rapidly made its way around Whitehall and was shown to Churchill himself. It represented more than just a collection of useful facts. It summed up a spirit of resistance, confirming to Britain’s leaders that some of those living under the tyranny of Nazi occupation were willing to risk their lives to help. The message was signed with the codename ‘Leopold Vindictive’ and asked for a response on the Dutch and Belgian BBC radio news. On July 15, only three days after Michel had set the bird free, the Belgians heard this on their radio: ‘Leopold Vindictive 200, the key fits the lock and the bird is in the lion’s cage.’ Sadly, the Leopold Vindictive story does not have a happy ending. The group of amateur spies gathered more intelligence but future pigeon drops failed to reach them. In growing frustration, they trusted a chain of resistance contacts but the Germans closed in. They arrested and tried Raskin, Joye and Arseen Debaillie. On October 18, 1943, in Dortmund, all three were guillotined. But still Operation Columba pressed on. Between April 1941 and September 1944, a total of 16,554 pigeons would be dropped in an arc from Copenhagen in Denmark to Bordeaux in the South of France. Only one in ten made it back alive. Some were lost on planes shot down before they had a chance to be released. Some lay unfound in a field. The Germans responded of course. Rewards were offered and punishments were draconian. An MI6 agent reported that a notice displayed in one Belgian town offered 625 francs to anyone who delivered a British pigeon. Rumours began to emerge that the Germans were planting false pigeons to trap people. Marksmen were stationed on the coast of northern France while a Columba report from the Loire Valley said that pigeons fell into enemy hands after a German observation post spotted the RAF flight passing overhead. But Operation Columba’s most deadly foe proved to be a natural one. It was the hawk. German hawks were flown along the coast from Belgium, France and the Netherlands to catch and kill Columba birds as they headed for Britain. Yet the ones that survived more than proved their worth, helping to pave the way for D-Day and victory. And for the French and the Belgians living under Nazi occupation, there was something else besides: the hope that these remarkable birds, released up into the freedom of the skies, would race back safely to their homes and help free their nation from tyranny. Gordon Corera is a journalist and the author of several books on intelligence and security issues. Since 2004 he has been a Security Correspondent for BBC News, where he covers terrorism, cyber security, the work of intelligence agencies and other national security issues. He will be speaking at CVHF on Friday 29th June about the Secret Pigeon Service – tickets are available here.